The Box Tree is one of the oldest buildings in Ilkley. Originally a Yorkshire stone farmhouse dating from 1720, home to a generation of gentleman farmers from Denton, the house subsequently bought by businessman, Septimus Wray – the owner of the Bridge House Gardens. This period saw the property developed for business and it was in the late nineteenth century that box trees were first planted in the front garden and thus became known as Box Tree House. During later years the Box Tree became both an antique shop and a tearoom, before the potential for a fine restaurant in Ilkley was recognised. Opened in 1962 by Malcolm Reid and Colin Long, the Box Tree quickly became the North’s most successful restaurant, with two Michelin stars to its name. Without exception, the Box Tree featured in every good food guide as renowned chefs Michael Truelove, Edward Denny and the more contemporary Marco Pierre White each made their mark on the menus and the history of the restaurant. More currently Simon and Rena Gueller have worked hard to reposition this restaurant and are themselves forging ahead in the story of the Box Tree. An iconic restaurant set in a charming sandstone cottage, with a plush, antique-furnished lounge and two luxurious dining rooms; it celebrated 50 years in 2012. Cooking is refined and skilful, with a classical French base, and dishes are light and delicate. Only the best ingredients are used. AS HEAD CHEF OF THREE MICHELIN STARRED RESTAURANTS, THE MOST RECENT BEING THE BOX TREE IN ILKLEY, WEST YORKSHIRE, SIMON HAS ACHIEVED A HIGHLY RESPECTED REPUTATION FOR DELIVERING INNOVATE AND EXCEPTIONAL STANDARDS OF CUISINE. Simon’s passion and highly driven temperament to deliver high quality food originates from the early stages of his career. 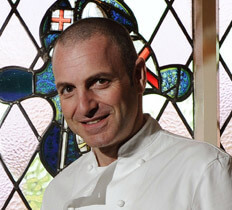 At just 24 years old, Simon first became a Head Chef / proprietor of Millers in Harrogate. In 1995 he then moved on to open Rascasse in Leeds city centre which went on to gain its 1st Michelin star within a year, hosting over 100 covers Rascasse became the largest starred restaurant outside London and its success helped to change the dining scene in Leeds. In addition the pair went on to open the eponymous restaurant in the business quarter of Leeds, a smaller, more intimate fine dining establishment where Simon earned a star for the second time. 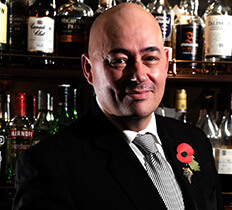 In 2004, Simon and his front-of-house wife Rena took over at The Box Tree in Ilkley. The couple managed to revive the once highly established reputation and in 2005 recapture the restaurant’s Michelin star, an award it’s held onto ever since. The couple take great pride in providing a high standard fine dining experience whilst retaining the unique essence and originality of The Box Tree. When Simon is out of the kitchen you will probably find him out on his bike. With a real love for cycling, Simon has recently completed all 21 stages of the Tour de France cycling alongside the likes of Lance Armstrong and Geoff Thomas raising money for Cure Leukaemia. WITH A DEVOUT COMMITMENT FOR DELIVERING A HIGH QUALITY FINE DINING EXPERIENCE, RENA IS FULLY DEDICATED TO ENSURING THAT THE RESTAURANT CONTINUES TO FULLFILL THAT COMMITMENT AND REPUTATION THAT IT HAS HELD ONTO FOR OVER HALF A CENTURY. Rena’s Role involves the day to day running of the business, focusing and supporting her management team with leadership and creativity. Rena is also responsible for the marketing, PR, websites and growth and development of both the Restaurant and the Outside Catering business, Box Tree Events. Since taking over The Box Tree with partner and Executive Head Chef Simon, the couple are highly driven to offer an exceptional experience with innovative food and the highest standards of fine dining, whilst retaining the essence of what makes the Box Tree so unique. With a love of countryside walks, including some of the picturesque scenery of Yorkshire, in her spare time Rena likes to walk her adorable dog Barney and (occasionally) goes cycling. Like Simon, Rena tries hard to support a variety of charitable causes. 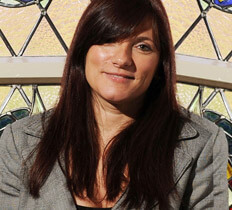 Rena also likes to take on new challenges and in 2012 she completed her first marathon in London. DIDIER IS BORN & BRED IN BRITTANY FRANCE, HIS CAREER STARTED AT THE CATERING COLLEGE OF DINARD STUDYING COOKING, SERVICE, OENOLOGY & WINES, AFTER GRADUATING IN SEVERAL AREAS OF THE CATERING INDUSTRY, IT TOOK SEVERAL YEARS TO DECIDE WHICH DIRECTION TO TAKE, HOWEVER, BECOMING A SOMMELIER AND FOCUSING ON WINE & FOOD PAIRING WOULD FULLY EXPLOIT HIS PASSION . Opportunities and fate made the decision easy when entering the group Accor in 87 , which helped him decide where he was going to fulfil his potential, sending him as apprentice sommelier to, La Tour d'Argent in Paris, Hotel Negresco in Nice, to Italy & then to England. He needed to update his knowledge with additional qualifications and returned to work, in Champagne, St. Emilion, Alsace & also in, Austria and Germany, where he worked in 2 & 3 Michelin starred restaurants. In 96, he came back to England, worked 4 years in west Sussex before moving to Yorkshire, as Head Sommelier. In July 2009 Didier joined the The Box Tree as Head Sommelier. He considers himself a person with great passion for wines & food. He Says sometimes, people love their cars but don't understand the mechanics, the real challenge and enjoyment is sharing that gift of knowledge & passion and making their experience more memorable one. Outside The Box Tree, Well, Didier is still Didier or (Didz), a nick name that Rena affectionately gave him. He is a Treasurer & Maître Compagnon Du Beaujolais Du Devoir De Skipton and enjoys hosting events, but most of his spare time is dedicated to family & friends cooking eating and (more) wine.